One of the first questions that SUV enthusiasts are asking about the CUPRA Ateca is: is it a SEAT? Well, not exactly. Spanish brand SEAT have decided to follow in the footsteps of their Italian rivals when it comes to branding the new CUPRA Ateca: that is, giving it its own brand. What is the CUPRA Ateca? How much is the CUPRA Ateca to buy and to lease? Like rival Italian brands such as Fiat, which is closely associated with the Abarth 595 (not a Fiat), the new CUPRA Ateca that’s for sale is equally not a SEAT. 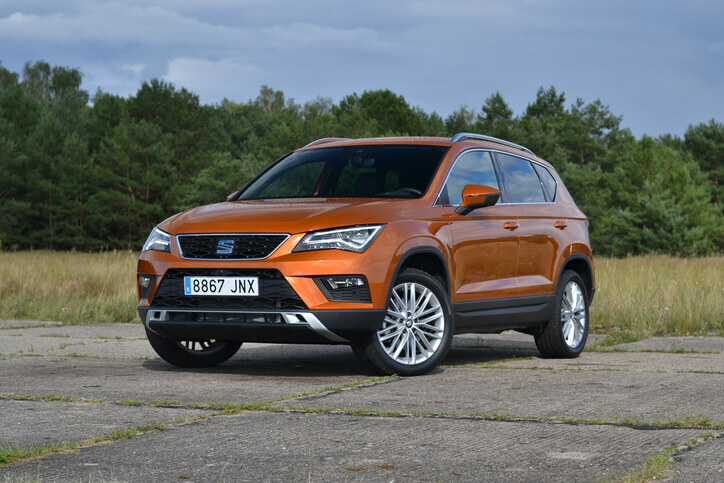 The key difference between the CUPRA Ateca and the SEAT Ateca is that the former uses the Cupra name as a performance badge, and the Cupra itself is a separate, stand-alone sub-brand with a different brief. Another similar example to compare this to is Citroën’s sub-brand - DS Automobiles. At Complete Leasing, we have a range of lease deals for both the CUPRA Ateca and SEAT Ateca cars, as well as Fiat, Abarth, Citroën and DS for that matter! Take a look at our leasing deals online or contact us now, obligation-free, and we’ll help find you the best lease deal in the UK to suit your needs. Back to the CUPRA Ateca. So, what of this different brief? For 2019, we have a CUPRA SUV, which looks very similar to an Ateca SUV (debatable in some circles, some of whom would call it a crossover), but let’s look past the branding. It boasts the engine of a Volkswagen Golf R, which is a 2.0-litre, four-cylinder turbocharged unit. This makes for some very impressive specs indeed. For example, the CUPRA Ateca 0-60 speed is a little over 5 seconds, while the top speed is a very respectable 153MPH – not bad for a crossover. In addition to this, it’s the brand’s first model of almost 300BHP – 296 to be exact, and 295lb-ft of torque. In addition to these goodies, we also have all-wheel drive, adaptive suspension, a custom-made exhaust, and a DSG automatic gearbox. 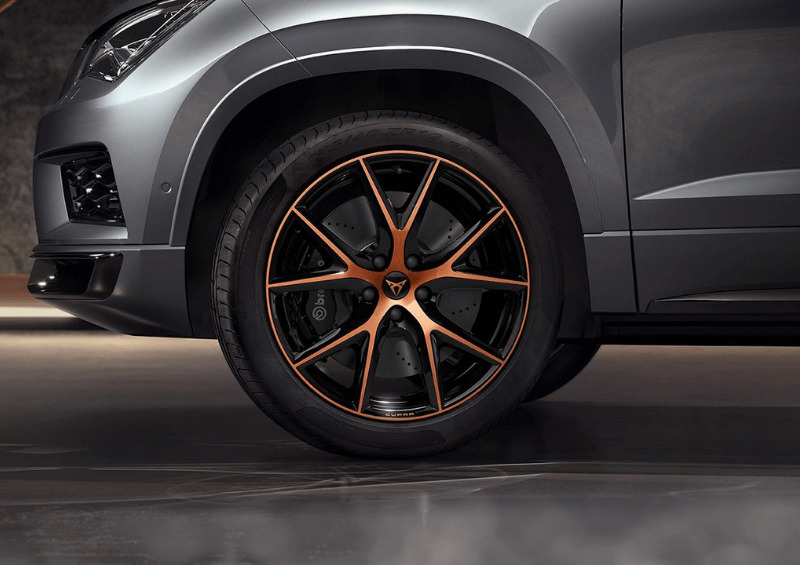 Other CUPRA Ateca options include the four-piston Brembo brakes (mainly used for high-performance vehicles). Last but not least, it’s important to mention that it has also been voted ‘Best Sports SUV’ in the ‘Car of the Year 2019’ awards by WHATCAR? It looks the part, too. There are wider front intakes together with glossy black grilles and real quad exit pipes. Wheels are available in copper or silver, going up to 19 inches in size, and there’s also a nifty little rear spoiler. The CUPRA dimensions are precisely 4,376mm in length, by 1,841mm in width, and by 1,615mm in height. The side profile might resemble a SEAT, but there’s more to the CUPRA than that. It’s not quite a hot hatchback and arguably, not quite an SUV, but it’s very affordable, and delivers high performance. Drivers are presented with six driving modes: Comfort, Sport, CUPRA, Individual, Snow and Off-Road. Put it into the CUPRA mode or the Sport mode, and you’ll notice that the adaptive dampers really come into play. You might not notice a huge difference in speed here, but there is a noticeable improvement in the throttle response. In terms of handling, it’s to be expected that corners are a little riskier in higher cars. However, it handles very well for an SUV, largely thanks to low, stiff suspension. Keep it to the CUPRA setting for the most responsive steering. On the inside, it’s covered in Alcantara, while the steering wheel is covered in perforated leather. The driving position is very comfortable and there is some favourable tech, such as the 360 bird’s-eye view camera. There’s an 8-inch infotainment screen, which comes with features such as the Apple CarPlay and Android Smartphone mirroring. 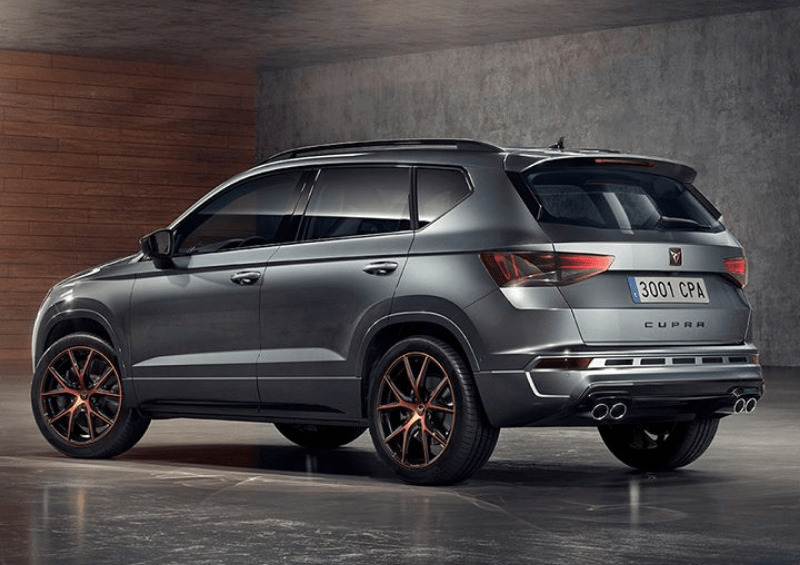 How much is the CUPRA Ateca UK? To buy, the CUPRA Ateca price starts at £35,330. However, there are many other CUPRA Ateca deals out there, if you’re not so keen on buying it outright. Lease deals for the CUPRA Ateca can start at anywhere from just over £300 per month, to more than £400, depending on the initial rental payment (sometimes referred to as ‘deposit’ – but you don’t get it back), the specifications you choose and the type of leasing you want – personal or business, for example. 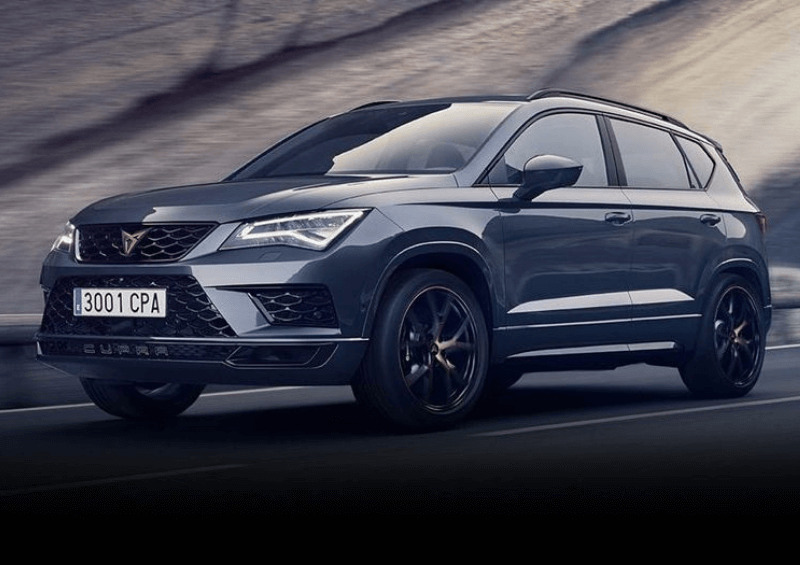 If you do want to own the CUPRA Ateca at the end of the payment terms, then a personal contract purchase (PCP) may be the best option for you. Get in touch with us to find out about the PCP deals available for you. 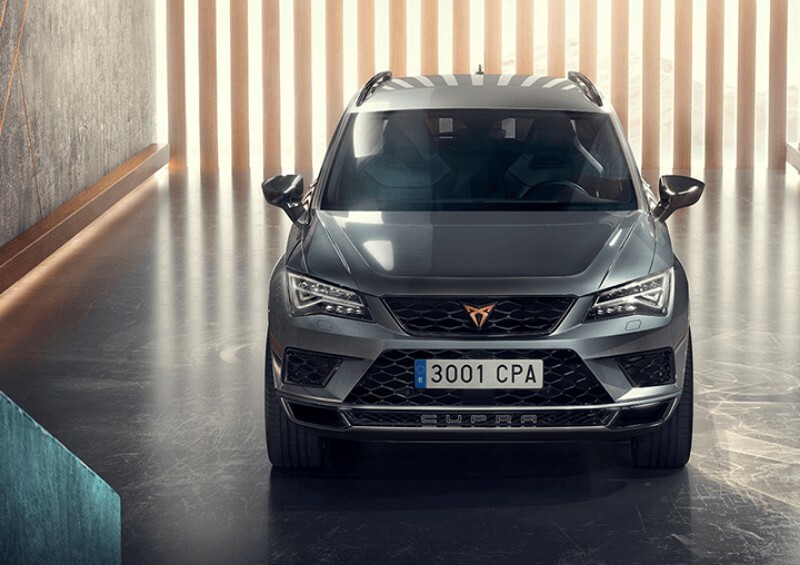 The CUPRA Ateca was released in September 2018, so you can lease a one today! Of course, we’d advise having a play with the CUPRA Ateca configurator first to see what specs take your fancy. 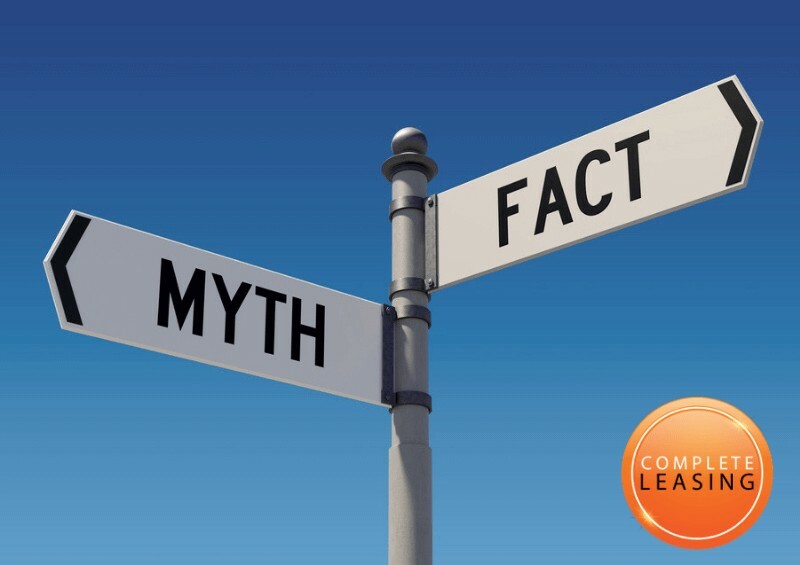 With us at Complete Leasing, you’ll be able to choose additional services such as a maintenance package (at a small extra cost), just in case the car needs any repairs during your contract. Generally, as most lease cars are brand new, they rarely come with any maintenance issues, but should you have an accident or another issue, the maintenance package will save you from any unexpected, expensive repair costs. Contact us to find out more! This high performance, well-handling SUV is very reasonably priced. Branding may confuse customers, but in this case, the CUPRA Ateca justifies its decision to go it alone! Feel free to contact us at any time via Facebook or Instagram. Alternatively, give one of our experienced representatives a call using the free number below and we will help answer any car leasing-related queries you may have or help find you the best car leasing deal in the UK, at no obligation!